The Series 9 Decamired Blue 1.5 Cooling Filter from Tiffen is for those who want a sure-fire way of getting accurate color temperature readings. Using this formula, you can transpose temperatures from one point to another easily and quickly. This system is also useful when you wish to bring a certain amount of creativity to color photography. Decamired filters are used to maintain consistent color temperature during the day's shooting. Decamired filters are available in two series - reddish filters that warm the light and bluish filters that cool the light with each series available in four densities: 1.5, 3, 6, and 12. When filters from the same series are used, they can be combined. 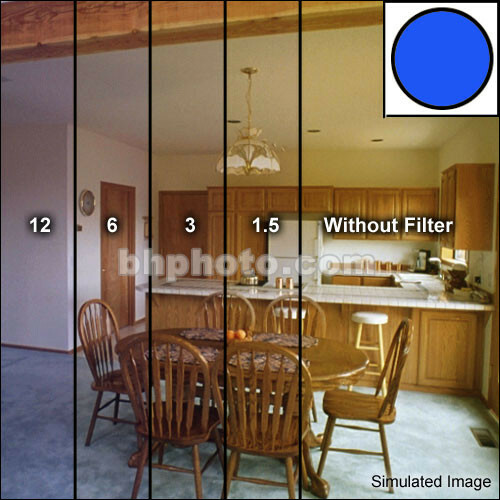 Decamired filters can be readily combined to create almost any required color correction. In measuring the color temperature of the light source, and comparing it to that for which the film was designed, required filtration can be easily calculated.